The Cannibal Queen™ is a famous open cockpit World War II Stearman biplane that still remains one of the most popular airplanes introduced in aviation history. Founded by Lloyd Stearman in 1927, the Stearman Aircraft Company began manufacturing biplanes out of Venice, California. 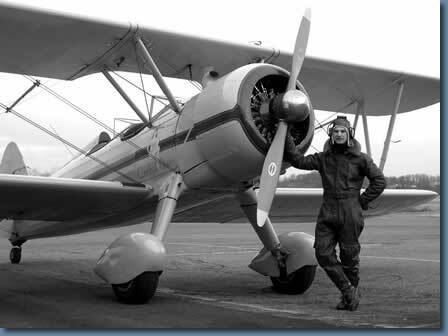 The Stearman is credited with the remarkable increase in the popularity of aviation in the 1930's due to "Barnstorming" and "Wing Walking" using the biplane. 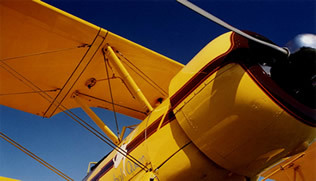 The Stearman Aircraft Company later branched off into what is known today as Boeing; and in the 1940's Stearmans were used by the United States military as training aircraft for novice pilots. Built in 1942, The Cannibal Queen™ was one of 300 planes manufactured that summer in Wichita, Kansas as a primary trainer for the Royal Canadian Air Force. Later that year the US Army purchased the plane: and The Cannibal Queen™ served her country for the remainder of the War. She then spent over thirty years as an agricultural spray plane before being lovingly restored in 1987. New York Times best selling novelist, Steven Coonts, based his non-fiction book, THE CANNIBAL QUEEN, on three glorious months that he spent exploring America from her cockpit in the summer of 1991. "Coolest adventure ever! I’ve flown in small planes before but never an open cockpit biplane. The ride was incredibly exhilarating. My pilot pointed out all the sites and even did some aerial tricks. A must-try!"